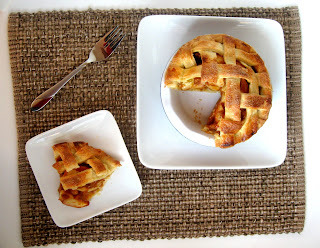 This recipe makes two 4 1/2" pies but it could easily be doubled and make one 9" pie. I have added the directions for that in the recipe below. I love the way that these pies are mounded up like I feel pies should be. Flat pies are pretty but don't have the same wow appeal. This would be lovely served up with some whipped cream or vanilla ice cream, although it doesn't really need either one. Pies are something I don't make often which is funny because it's one of my husband's favorite desserts. So when he came home from work and there were two small pies on the counter he was pretty excited about that. I'm surprised they weren't gone before the night was over, but he did take some for lunch the next day. 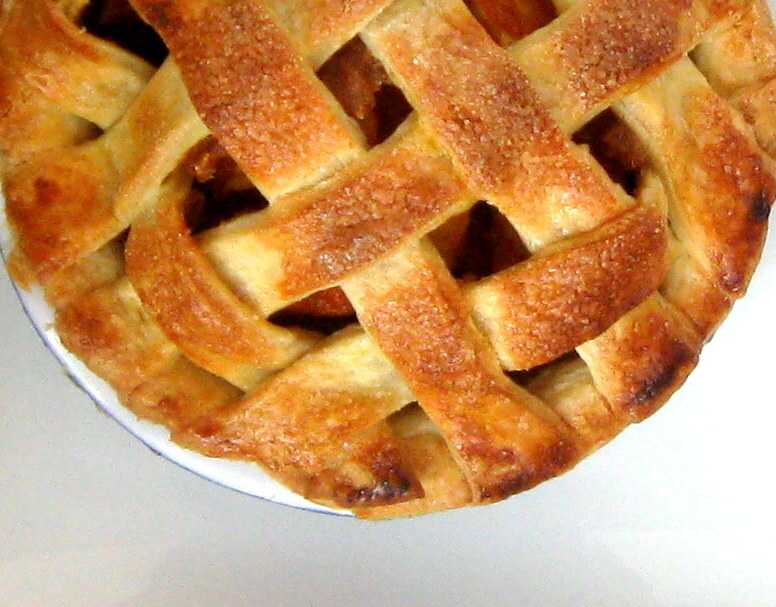 You may think of the 4 1/2" pie is perfect for one but mostly they're great for splitting, unless you're really hungry. The two smaller dishes equate to half of a regular 9" pie so it's easy to convert recipes if you want them smaller portions or bigger portions. 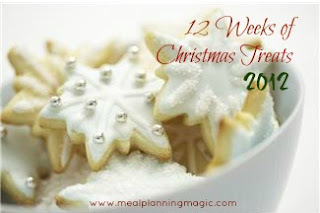 This 12 Weeks of Christmas Blog Hop I referred to is hosted by Brenda at Meal Planning Magic. She's kind enough to orchestrate the whole hop and let all of us be a part of it. If you would like more information on how to join the hop check out her site and she can help you get everything you need. 1. Preheat oven to 400F. Put the flour and salt in the bowl of a food processor. Process until mixed. Add the butter and process until the mixture is about pea size and even in texture. 2. Mix together the egg, vinegar, and water in another small bowl or measuring cup. Add the egg mixture into the flour mixture in the food processor through the feed tube while the processor is running. 3. Process until the dough comes away from sides, about 15-20 seconds. Do not over mix or the dough will be tough. 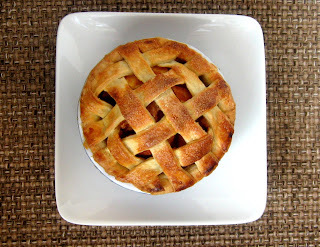 Roll out dough to ¼” thick and place into pie pan(s), reserve some dough for the lattice. 4. Slice apples into ¼” slices, set aside. In a medium bowl stir together lemon juice, brown sugar, cinnamon, ginger, pumpkin, and flour until blended. Stir in apples. 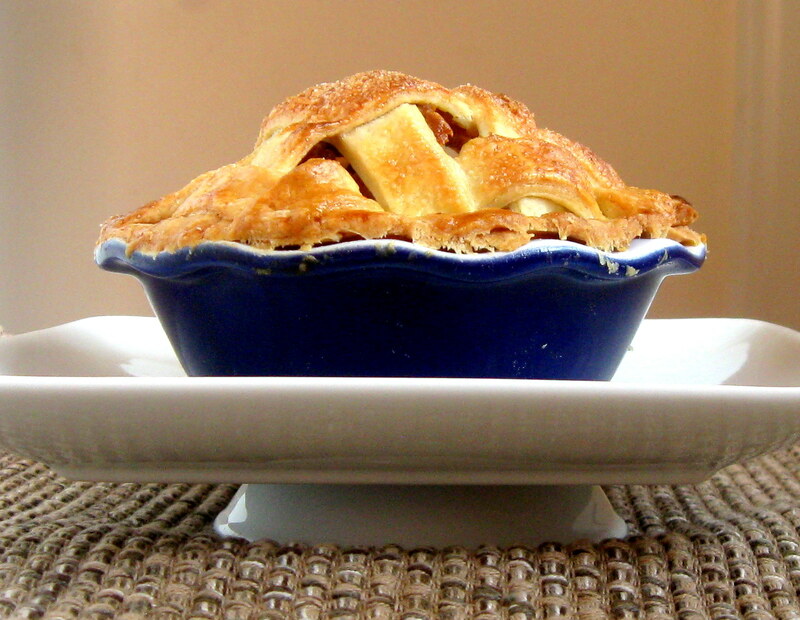 Fill the unbaked pie shells with apples, they will be heaping. Roll out the remaining pie dough to ¼” thick and slice into ½” thick strips. 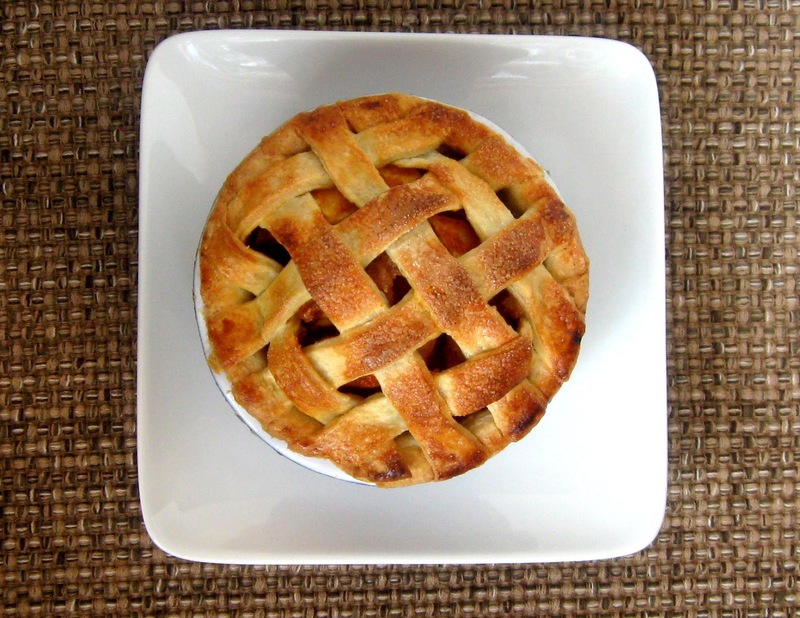 Use those strips to create a lattice or other design on the pie(s). 5. Mix together the whole egg and milk in a small bowl and brush the mixture over the pie crust. Bake 4 ½” pies for 40-45 minutes or until the apples are slightly softened and the crust is brown. If baking a 9” pie then bake for 1 hour to 1 hour and 10 minutes or until the apples are slightly softened (inserting a knife carefully in between the lattice will help determine this). The pie will not be filled and bubbly with liquid, but there will be plenty of moisture from the pumpkin. Serve warm with vanilla ice cream, if desired. (If you double the crust recipe for a full pie, do not double the egg, just use 1). The combination of flavors sound great, I never thought of mixing them in a pie! I struggle each year with the decision - do I make a pumpkin pie, or an apple pie? I never thought of making both in one! Thanks for sharing! The pie looks great. Its so interesting that you used both apple and pumpkin in the same pie. Will have to try that sometime! Thanks Trisha, They really complement each other and it would be a lovely surprise addition to a dessert table. I am in love with this combo idea, two of my favs! The pie is gorgeous too! This looks like a great combination and the pies look so pretty. Glad to be baking with you.